Howdy, friends! I’m still in Georgia and sucking down all too much sweet tea. It’s glorious. What I bring to you today is, hands down, the most delicious egg dish I’ve ever tasted. Not only are these eggs ridiculously tasty, but they only take five minutes to make. As in…you should make them right now. You won’t be sorry! If you’re like me, you don’t got no ramekins. Currently in my cupboard, I have three Rudy’s barbecue cups, four Bonne Maman jam jars, two plastic cups from Target and some random plates from the thrift store. I don’t have time for ramekins! They’re way too small for my liking. So instead of baking these eggs in the traditional ramekin, I make do with what I got—-a cast iron skillet. Basically, you sizzle some butter and cream in your skillet then pour in the eggs and top with goat cheese and tomatoes. It’s pretty awesome and will send your tastebuds into overdrive. I like to call meals like this “brlundinner” pronounced berrrrrluuuundinner, which obviously means it’s a mix of breakfast, lunch and dinner. Duh. When you bake the eggs, the yolks still remain semi-soft but are definitely not runny. The hefty sprinkle of goat cheese just puts everything over the edge and literally makes me curl my toes in excitement. You could also add some fresh herbs or swap the cheese out for feta or cheddar, although I personally don’t know why anyone would do such a thing. Set your oven to broil on high. Carefully crack eggs into a small bowl, being extra careful not to break the yolks! Set aside. Add butter and cream to a cast iron skillet and place in oven for two to three minutes, or until butter has melted completely. Remove from the oven (don’t forget to use a hot pad!!) and quickly pour in the eggs. Top eggs with goat cheese, grape tomatoes, salt and pepper and broil for an additional five minutes. Even if the yolks still seem pretty runny, take skillet out—they will carry-over cook and you don’t want to over bake your yolks! Serve baked eggs with bread (or pitas). 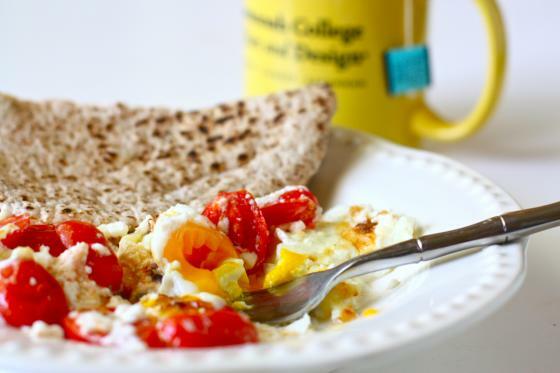 goat cheese and eggs are one of my favorite combinations out there! i’ve never actually done skillet-baked eggs, but after this post i think that has to change. it looks perfect! This will make a good alternative dinner one night this week! Thanks for the non-sweet recipe! this looks amazing. I just kicked of a vegetarian deal for the rest of the month but this is going to be one of the first things I indulge when I’m done. Perect trifecta of ingredients. I dont eat nearly enough goat cheese! Enjoy the South and your parents! Cooked grape tomatoes are the best thing ever….they get all juicy and flavorful! I am trying this TODAY. I love egg dishes! And ever since your roasted vegetable and goat cheese pita post, I have been craving goat cheese! This looks divine, I love anything with eggs yummm! You had me at goat cheese and eggs—Sold. Looks delish. Eggs, goat cheese…my husband would beg me for this. I love tomatoes in all shapes and sizes, so that’s the part Im into. This looks delicious! I love goat cheese and eggs but never tried baked eggs. Definitely have to now ;). yummy!! this looks great! I hope youre having an amazing time in GA! 🙂 wishing I was in Savannah! You had me at Goat Cheese. Love this!!! Best Egg dish you’ve ever made? A perfect recipe for brunch! I’d maybe add some pesto and serve it over toast. YUM! 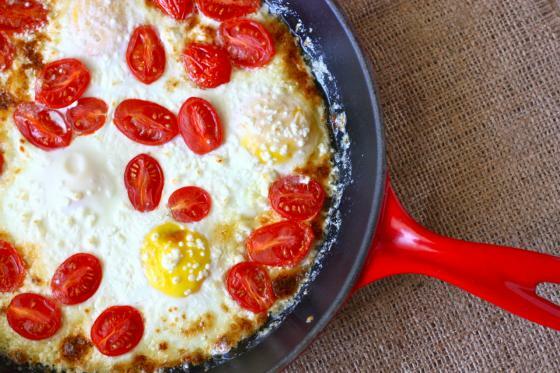 I absolutely love eggs + tomatoes — this looks so delicious! What a gorgeous looking dish! Love the bright colors. This would be perfect for a summer brunch! Baked eggs are SO good. This looks great! I can’t wait to try it. My husband is an egg fanatic…and I’m trying to learn to be one so this could take it to the next level. I’ve been on a grape tomato kick lately. .love them in my eggs, too! This looks great! I often add tomatoes, cheese, something green like cilantro, spinach or dill to eggs…love. Haven’t thought of goat cheese though. Looks great–I’ll try it. Thanks. Gorgeous photographs in this post! I feel like without eggs in my life, I would feel like I have lost something significant. And now I am walking away from my computer to make this glorious dish. yum! eggs and goat cheese are always a winning combination, i love how the goat cheese will sort of half melt in the eggs leaving this glorious consistency. yum. oh and top with basil too! Ooh I just bought sone goats cheese- clearly I know what it will be used for! Yum, you had me with eggs and cheese, I love that the yolks will be semi runny too. =) Love that part! Love the tang of goat’s cheese with eggs – such a delight to the taste buds! Add in cherry tomatoes and I am sold – love the pops of sweetness they add. YUM. That looks wicked awesome! Oh eggs, how I heart your many incarnations. I’m not usually a huge fan of egg dishes, but this looks REALLY Good! I love tomatoes! Can I substitute a couple egg whites for a couple of the eggs (or all the eggs?)? Goat cheese and eggs? Don’t mind if I do! I love when the cheese gets a lil teeny bit burny, just enough so that there’s a lil crispiness to complement the melty gooeyness. Glorious! I’ve got all the ingredients so I’m trying this tomorrow!! Does anyone have suggestions on what herbs would be good to add? I must have this! I just got a few mini cast iron skillets. This would be adorable in little personal sized portions! I’ll be trying this soon! 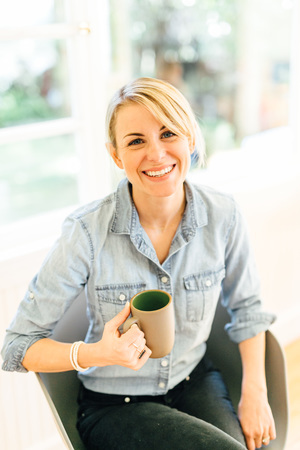 I need help getting skillets and pots and pans- you make such great looking recipes and have such good technique but I imagine the tools are so important- are there bare-bones staples I should stock my fist kitchen with? Welcome back to Savannah! The eggs look delicious. Fresh eggs make all the difference too! Have fun if you visit Back in the Day too! Oh my, drool. I can’t wait to make this! I have some polenta, which would make a mighty fine crust. Wonderful with fresh, fluffy bread. Eggs are definitely one of my favorite foods so this dish sounds great! And I love that it’s a mix of breakfast, lunch, and dinner! These look great! I’ll bet the goats cheese was awesome with the grape tomatoes! mmm…I love tomatoes. My plants are just starting to flower! I can’t wait to make this fresh from the garden. Yum! I am trying to lose weight and have been very particular with what I eat lately, but eggs always have a special place in my tummy. 🙂 This total package looks deliciously good (and healthy). Baked egg dishes are very popular in my house and I know this one would be a hit. Lovely photos! Oh I am so making this. Love the goat cheese and eggs combo! Grape tomoatoes, eggs & cheese? Three of my favorites. Sounds delicious! I have to try it. Love this! Looks so gorgeous with the vibrat tomatoes! Enjoy time at homeee 🙂 love the addition of the tomatoesss! This egg dish looks fantastic! Love the addition of the goat cheese. Beautiful! Hey! I love this recipe so much I shared it on my site, http://peacewithinyoga.blogspot.com/2011/05/back-at-it-on-monday-good-bad-and.html. 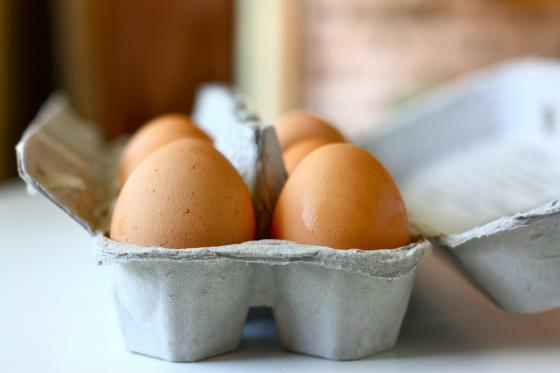 I love cooking with eggs, so good for you and so cheap! 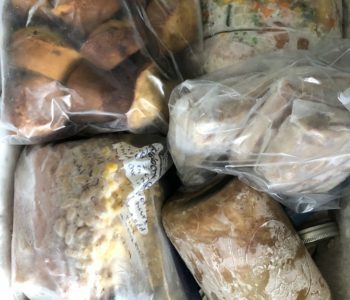 Thanks for new recipies! Looks yummy…although I’m not a goat cheese fan so I would have to swap it out for some cheddar! 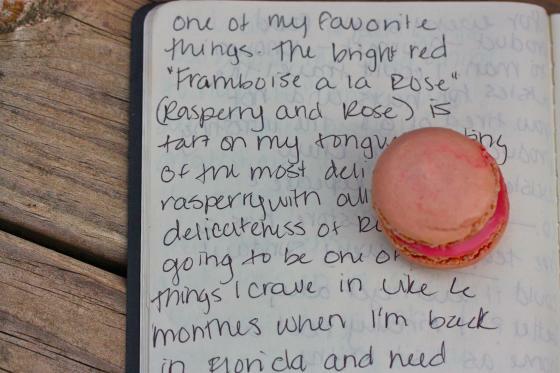 I’m seriously falling more and more in love with your blog! Your recipes are so easy but have the most simplisticly divine taste to them! Love everything but the goat cheese. I would swap for cream cheese instead. I believe you! Anything with cream, butter, and goat cheese has GOT to be the best thing I’ve ever tasted! Oh, wow! What a fabulous recipe and I totally agree on the brlundinner thing. I’d have this any time of the day. What a great recipe!Easy and delicious!Yum! Yum! Your photos make it look so appetizing and I’m not even a huge egg fan! Another winning combination, Jenna! And so quick and easy! Delicious. Just tried it, serving it over quinoa since I can’t eat wheat. The only thing: The egg whites are a little runny for my taste, and to get them firm enough by baking, the yolks got a bit too done. Any suggestions? Ahh how I love your posts! NO IDEA how I missed this one! But I did – sadly, and now I’m so happy to find it! 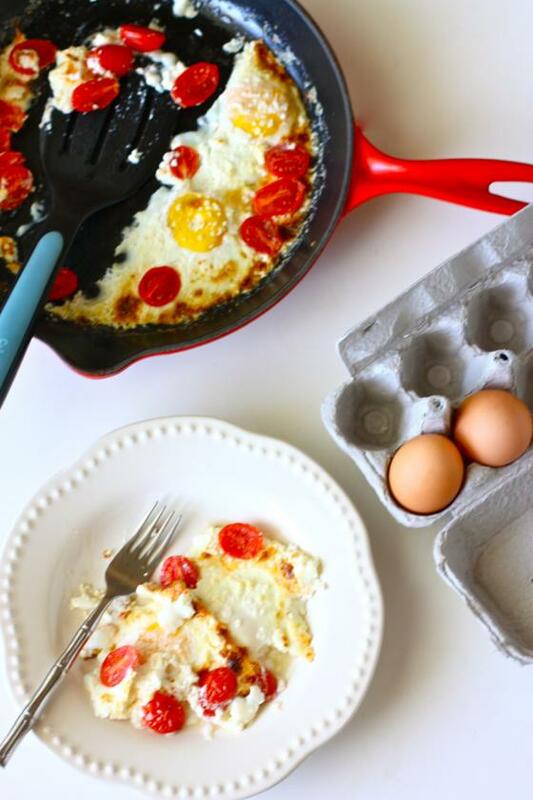 Definitely making this on Sat morning.. Eggs, goat cheese, cherry tomatoes.. maybe a little bacon 😉 yummm!! Can’t wait! Thanks for the awesome photos! Love them! My broiler is kind of touchy… Think I can do this recipe and just bake it? If so, time and temp recommendations?